Tina standing by her poster at TAS. Eagle Cave (41VV167) is a large dry rockshelter with deeply stratified deposits spanning the Early Archaic through Late Prehistoric periods. 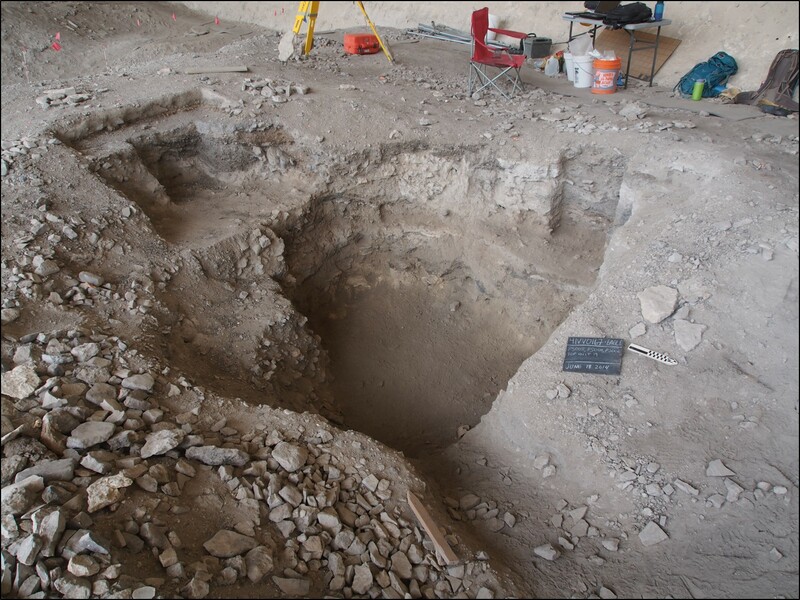 My thesis research focuses on deposits in the northern sector of the shelter sampled during 1963 excavations by UT-Austin and again a half century later by Texas State University in 2014. My goal is to use multiple lines of evidence to evaluate the natural and cultural formation processes that resulted in the complexly stratified, culturally rich deposits present in Eagle Cave. Our ongoing analysis involves a robust geoarchaeological sampling strategy that included the collection of micromorphological (micromorph) samples from Profile Sections (PS) 3 and 4 in Eagle Cave. This poster highlights the benefits and difficulties of collecting micromorph samples from fragile rockshelter deposits and shows how the analysis of the resulting slabbed samples and thin sections can aid in evaluating site formation processes. 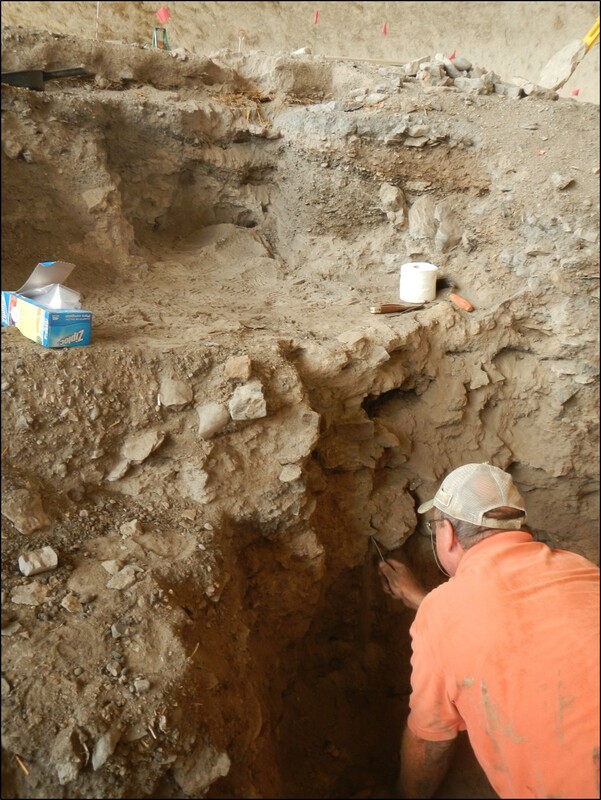 Profile Section 3 and 4 excavations in Eagle Cave in 2014. Photos taken after initial recordation and sampling, but prior to geoarchaeological sampling. Charles Frederick collecting micromorphological samples from PS4 in Eagle Cave in spring 2014. *The micromorph samples were carefully carried out of the canyon and up to Jack Skiles’ shed located a few hundred feet from Eagle Cave. Had the impregnation happened further from the shelter, these friable samples would have been far less successfully embedded. 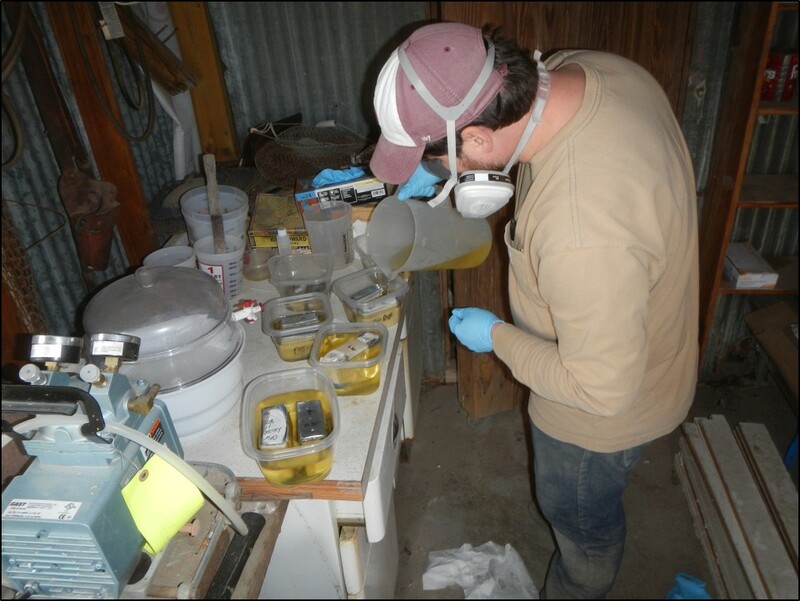 Dan Rodriguez impregnating micromorphological samples with MEKP in Jack Skiles’ shed. The sampling strategy was fairly simple: capture as many stratigraphic layers (strats) as possible within the PS3 and PS4 profiles. As archaeological and geoarchaeological sampling had already occurred prior to the micromorph collection, some strats identified during the initial profile recordation were no longer visible in the profile. Specific types of strats that were especially important to capture in the micromorphs included microstratigraphy such as thin lamina and lenses as well as strats that were associated with cultural features. Using this strategy, the 13 relevant micromorph samples captured approximately 27 of the 85 total stratigraphic layers identified in the field. A total of 22 thin section slides were made then from the 13 micromorph samples. Micromorph sample MM1 from PS3A (FN 30744). This micromorph slab was cut into three 4 x 6 cm blocks to be sent off and made into thin section slides (denoted by red boxes). The three sections were numbered FN 30744-1 through 30744-3. High resolution scans of each of the resulting thins section slides are presented on the right. Thin section analysis is currently underway. Thin section slide 30744-1 from PS3A. Thin section slide 30744-2 from PS3A. This thin section contains the lower boundary of strat S42 and S43. 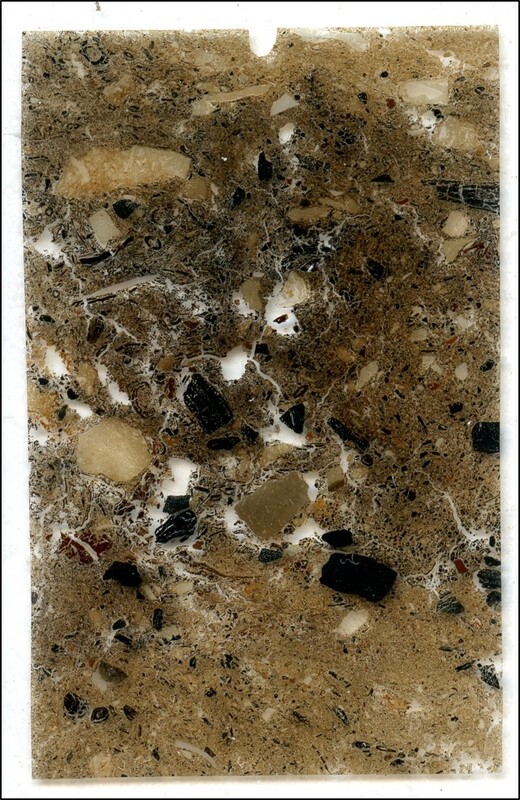 S43, was also recorded as an “ashy” layer, but does not appear so in thin section. 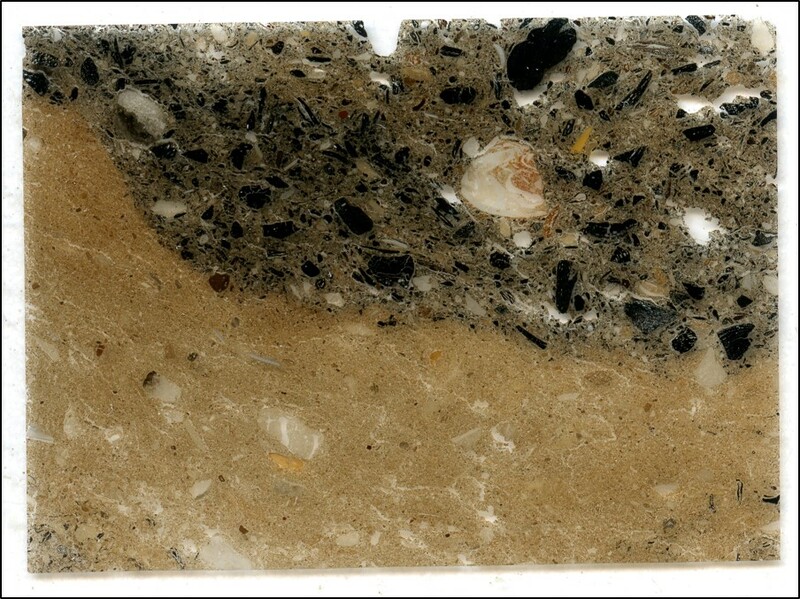 Similar to S40, numerous charcoal and rock fragments are visible in thin section. 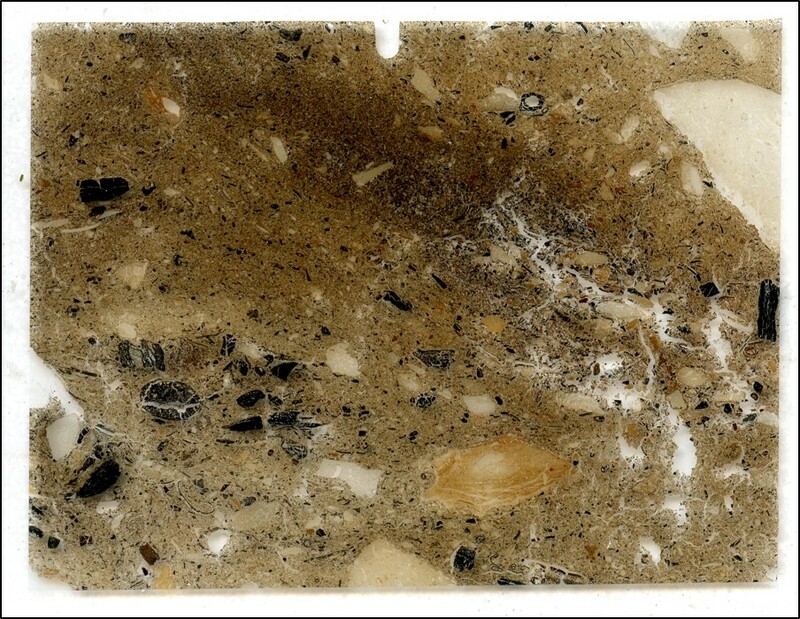 Thin section slide 30744-3 from PS3A. This thin section possibly correlates to strat S51, which was recorded as an animal burrow. In thin section, this looks very similar to S43 and may have been misidentified during micromorph collection. S51 may have been completely removed during initial sampling. Additional analysis needs to be done to identify whether post-depositional processes are present. The deposits in Eagle Cave, like many other Lower Pecos rockshelters, are very dry and have a loose consistency. This posed many challenges during initial recordation of strats and with the subsequent geoarchaeological sampling. Profile Section walls became enveloped in a film of dust with the slightest breeze or movement. Despite efforts to clean walls prior to all documentation, observations during strat recording were somewhat hindered by the persistent dust. The collection and analysis of micromorph samples, however, allows for a clearer examination of stratigraphy and the relationships between various deposits. Characteristics that aid in deciphering formations processes, such as boundaries between strats, are especially difficult to determine when obstructed by dust. Thin sections made from the micromorph samples can provide information crucial to the study of formations processes such as the size, orientation, sorting, and mineral composition of grains, organics, and artifacts as well as post-depositional disturbances of sediments. 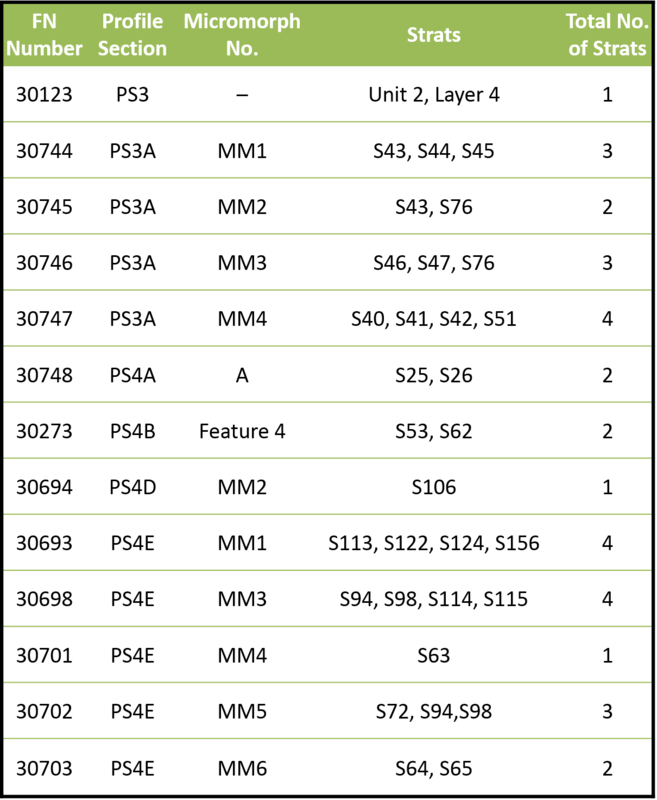 Since the micromorph samples in PS3 and PS4 were collected after all other sampling had been completed, it was sometimes difficult to correlate the samples with the strats initially identified in the field. In hindsight, ideally the micromorph samples should have been collected immediately after the strats were identified and documented to allow for a more accurate correlation. Field collection is also not always successful in loose deposits such as these and many first (and second) attempts at collection failed. Patience and perseverance are necessary qualities to have in this type of setting. The entire micromorph process, from collection to analysis, is a lengthy one but the potential information that can be obtained from this type of analysis greatly outweighs the challenges you may face along the way. 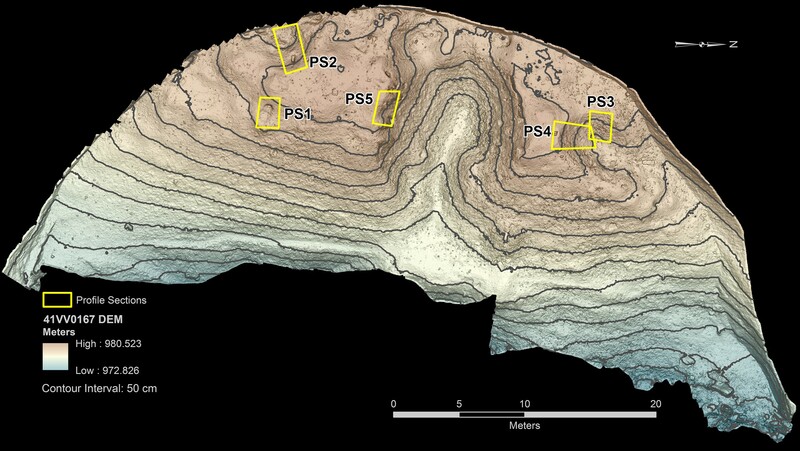 Left: Annotated SfM image of PS3A depicting stratigraphic layers identified during initial recordation; Right: Micromorph block MM1 ready to be removed from profile PS3A. MM1 collected from area where strats S40-42 and S51 were initially recorded, but as you can see, the strats do not quite look like how they did prior to sampling. Note: In situ, many of the strats look like ash deposits. However, as you can see from the MM1 block these “ashy” deposits are not in fact ash, but have a dark-colored matrix with large quantities of rock, charcoal, and other inclusions. The dusty field conditions make it difficult to characterize the strats with a high level of accuracy during initial recording. Long inhabited limestone rockshelters with deeply stratified deposits, such as Eagle Cave, can be difficult for an archaeologist to interpret. The natural degradation of the shelter itself, combined with human modification and natural forces create often complicated stratigraphic deposits. My thesis research involves a multidisciplinary approach to evaluate the formation processes evident in PS 3 and 4. The ongoing analysis of the micromorph slabs and thin sections from this sector of the shelter will help elucidate some of these complex processes and contribute to the overall analysis of formation processes in this sector of the shelter. 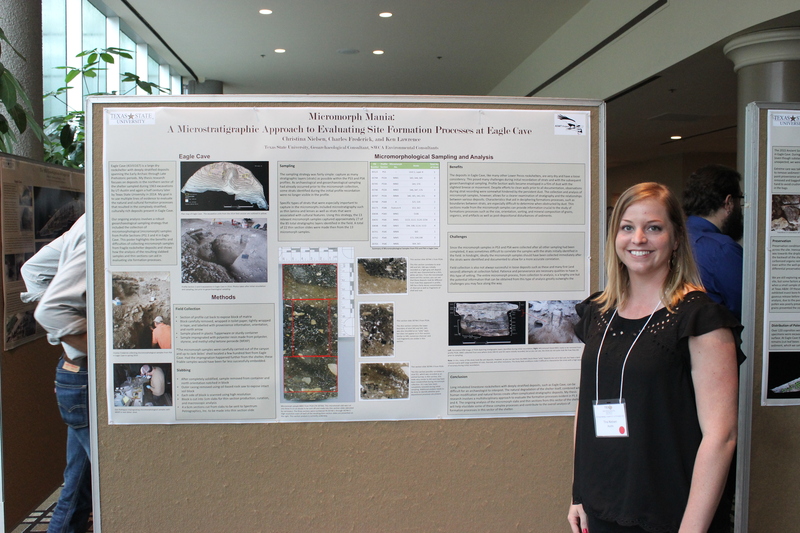 This entry was posted in 2015 TAS Poster Symposium, Eagle Cave, Geoarchaeology. Bookmark the permalink.